Four species of wild cat exist in Arizona, and a fifth may appear sporadically. Of these felids or wildcats, the bobcat and the puma are widespread and quite common. Particularly in the Madrean Archipelago of the state's southeast -- defined by isolated desert mountain ranges, or "sky islands" -- observers might potentially glimpse several other cats more typical of Mexico and the American tropics. Arizona is home to four species of wild cats. The bobcat and puma are found throughout the state while the jaguar is found in the southern portion of Arizona and the ocelot is found mostly in the southeast. While their presence hasn't been confirmed, the jaguarundi is also believed to live in the state as well. The numerous bobcat inhabits all of Arizona, from the arroyos of the Sonoran Desert to the rimrock of the Colorado Plateau. Typically two or three times the size of a housecat, this wily felid can be identified by its proportionately large, tufted ears, its namesake stubby tail, and its sandy or rufous-brown spotted coat. 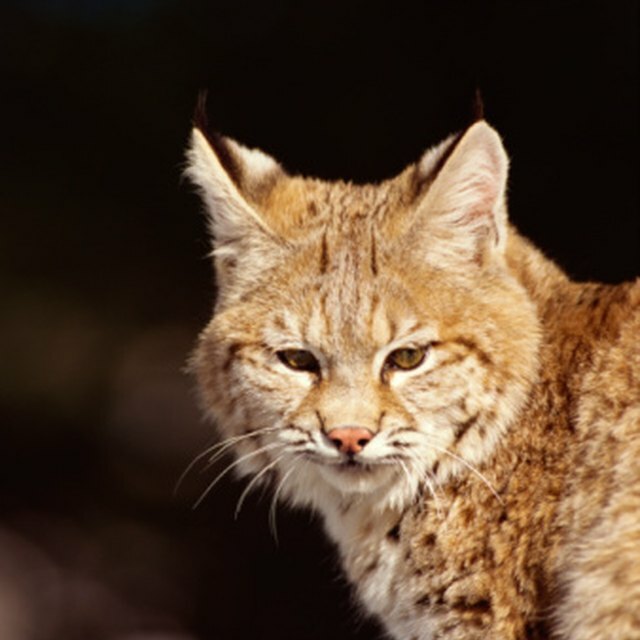 Bobcats flourish in a wide variety of habitats, including desert scrub, shrubland and closed conifer forest. They prey on any small creature they can catch -- everything from frogs and snakes to hares and grouse -- and, particularly in the case of males, sometimes tackle bigger quarry such as deer. The puma -- also called cougar, mountain lion or panther -- is the state’s second-heaviest felid after the jaguar and though rarely seen, is also broadly distributed in Arizona. Large males, or toms, may weigh up to 120 kilograms (265 pounds). Uniformly tawny in most cases, the puma has a proportionately small head, muscular body and a long, heavy tail. It may be encountered in many different habitat zones, though it’s uncommon in barren desert flats. This formidable hunter, which may clear 14 meters (45 feet) in a single bound, primarily targets mule and white-tailed deer, but will also take peccaries, elk, porcupines, coyotes, snowshoe hares and other varied prey. A 2012 Arizona Game and Fish Department assessment estimated that the state harbored between 2,500 and 3,000 pumas. More associated with the tropical forests and wetlands of Central and South America, jaguars -- the third-largest felid behind the tiger and lion -- are also native to the American Southwest. In Arizona, the big cat historically ranged the Madrean Sky Islands, the Mogollon Rim and the Grand Canyon country. No breeding populations are currently known, but several solitary jaguars -- all thought to be males -- were documented in southeastern Arizona since the 1990s. The recovery of the jaguar in Arizona and elsewhere in the U.S. depends partly on the health of populations in northern Mexico and the availability of protected corridors linking habitat blocks. In 2014, the U.S. Fish and Wildlife Service designated roughly 764,000 acres of “critical habitat” for the species in Arizona’s Pima, Santa Cruz and Cochise counties, as well as a portion of Hidalgo County in New Mexico. Two much smaller Latin American felids reach part of their northern range limit in Arizona: the ocelot and the jaguarundi. The former, a large-eyed, beautifully spotted cat roughly the size of a bobcat, is occasionally recorded in southeastern Arizona: A healthy male cat was photographed in the Huachuca Mountains in 2011. The dark, slender, long-tailed jaguarundi, which inhabits southern Texas, hasn't been confirmed in Arizona, but the Arizona-Sonoran Desert Museum reports that unconfirmed sightings occur with some regularity. Shaw, Ethan. "Types of Arizona Wild Cats." Sciencing, https://sciencing.com/types-arizona-wildcats-8370492.html. 10 April 2018.